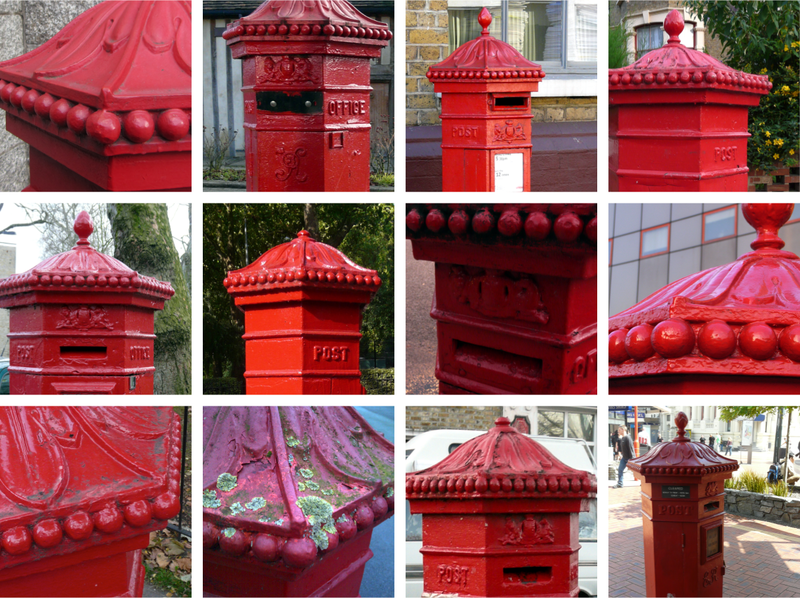 John Wornham Penfold's distinctive hexagonal letter boxes date back to 1866 and were manufactured by Cochrane Grove & Co in Dudley. Made in three different sizes, the nine different designs featured acanthus leaves on the top and balls/seeds around the edges. Many originals, as well as a few replicas made by Machan Engineering in the 1980s, still grace our streets today and I love it when I spot another one. So far, I have snapped ten in London and one abroad. It's interesting to note how five of these are situated really close to each other in an area bounded by Clissold Park, Finsbury Park and Highbury Fields. Top row: Tower Bridge (the first replica), Walthamstow Village (closed with a black metal plate that makes it look like a highwayman! ), Battersea Village and Queens Drive. Middle row: Highbury New Park, Highbury Grove (missing its finial), Prince Albert Road and St Pancras Way. Bottom row: Aberdeen Park x2 2008 vs 2014 (the second pic shows it needs a new paint job! ), Nevill Road (also missing its finial) and Wellington, NZ. Find more pictures and information in a Flickr group, here. I spotted the one in Aberdeen Park when visiting a friend. I couldn't figure out when it was from...Do these postboxes have the normal VR crest on them? Ah maybe I just wasn't looking in the right place...Small children were trying to hurry me past! My dad always pointed out old postboxes on holiday..Some of the geeky fascination has clearly remained!